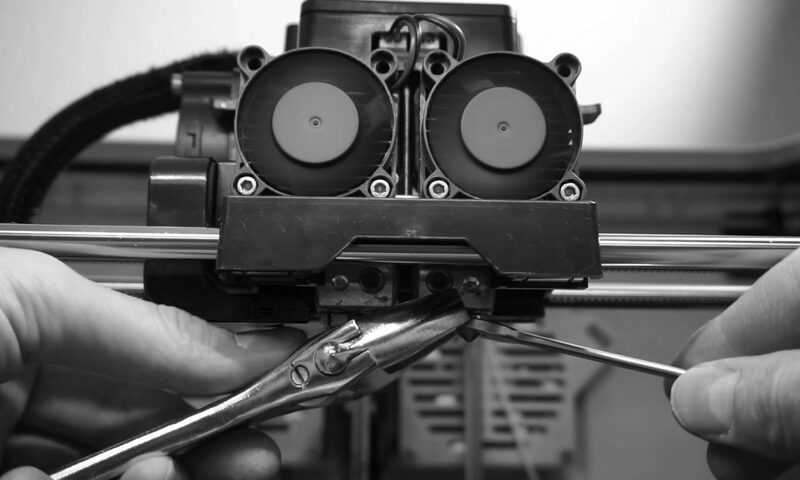 The Flashforge Dreamer 3D printer is equipped with equipped with brass mk10 hotends. These standard hotends use a PTFE (teflon) tube which runs all the way down into the nozzle. The PTFE tube acts as a heat brake and prevents the filament from melting before it reaches the hotend. However, when using the hotend at higher temperatures, the teflon tube starts to turn dark and the diameter shrinks, trapping the filament inside. The only option is then to replace the teflon tube and try again at a lower temperature. The hotends are reasonably priced and shipping to countries outside the US is only $4,95. (padded envelope). 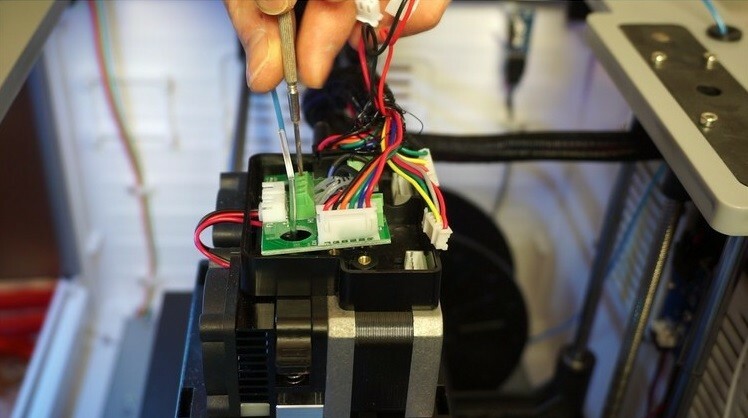 On their website there is an excellent tutorial for installing the hotend on a flashforge Creator Pro. Then why this article? Well, to provide an independent (re)view on installing the Micro Swiss hotend and to cover items specific to the FF Dreamer. Also, I will test the hotend with a recently released polycarbonate filament, PC-plus, by Polymaker. 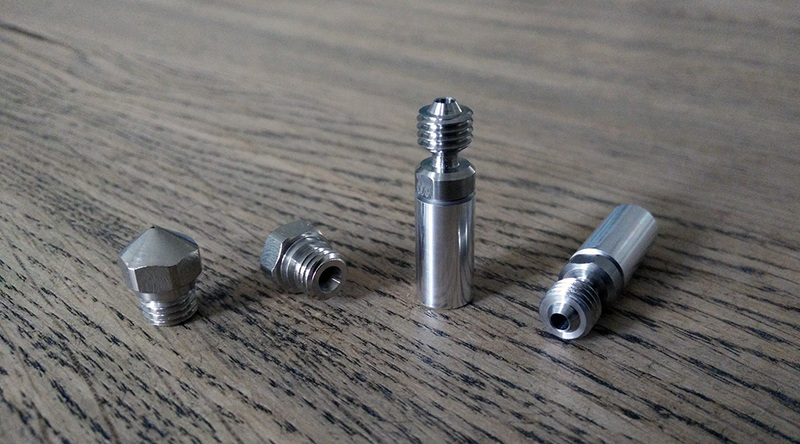 In order to remove the old hotends, pre-heat the nozzles to operating temperature of around 220C. Unscrew the nozzles using an adjustable wrench and a 9mm wrench. Be careful not to damage the insulation around the heating blocks. Turn off the pre-heat function when the nozzles are removed. Remove the PTFE tubes with a small pair of pliers. Depending on how long the tubes have been in place it might require a bit of force to pull them out. Remove the top cover on the extruder assembly. Mark the wires for the heating cartridges and thermocouples. Even ink of permanent markers does not adhere very well to the cables of the heating cartridges. I found this out the hard way. So it is probably better to mark these wires with (painters)tape. Unscrew all wires from the terminals and disconnect the extruder fans and stepper motors. The print board can be taken out by removing 2 screws. Unscrew the two long screws to remove the bottom of the enclosure. 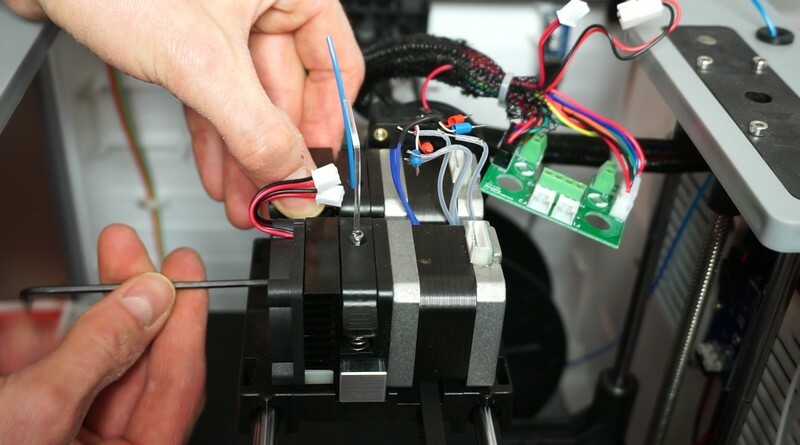 Remove the extruder fans and stepper motors by unscrewing the horizontally placed screws at the front of the assembly. 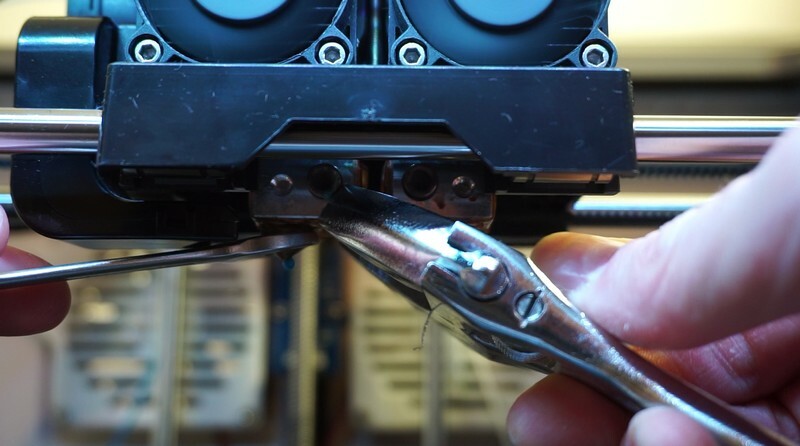 Remove the cooling bar by unscrewing the two screws at the bottom of the carriage. Place the cooling bar on a work surface outside the printer to allow for easy access to the nozzles. Before removing the nozzles I marked them with left and right and also marked the holes of the cooling bar to prevent errors during reassembly. The nozzles can be removed by loosening a set screw at the back of the cooling bar. The set screws might be difficult to loosen due to the frequent heating cycles. Due to a minor design flaw in the extruder bar it might be hard to remove the thermal tubes. If the set screws were tightened very hard, they will have damaged the surface of the thermal tube. Due to the tight fit with the hole in the cooling bar this can cause the tube to get jammed inside the hole when attempting to remove it. In my case this happened with only one of the thermal tubes. The problem is easily solved by tapping the thermal tube out using a hammer and a punch. When this procedure is performed carefully it should not create additional damage to any of the parts. 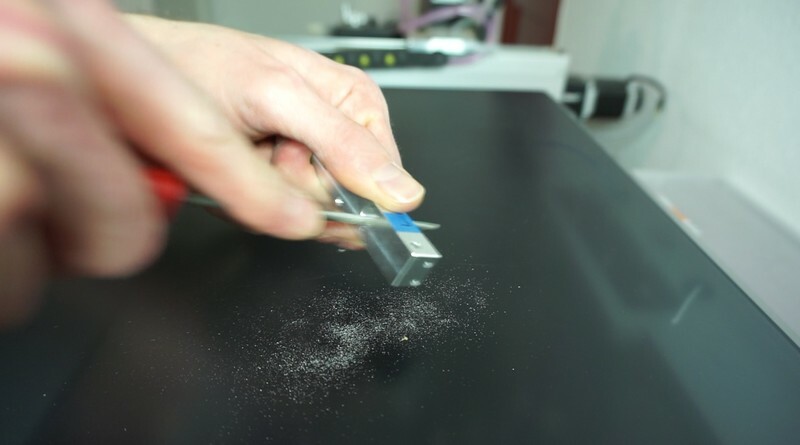 In order to prevent this issue from reoccurring in future assembly operations the manual recommends to use a round file to remove some material at the area where any burrs on the thermal tube might get stuck. This is optional, but only takes around one minute to perform. 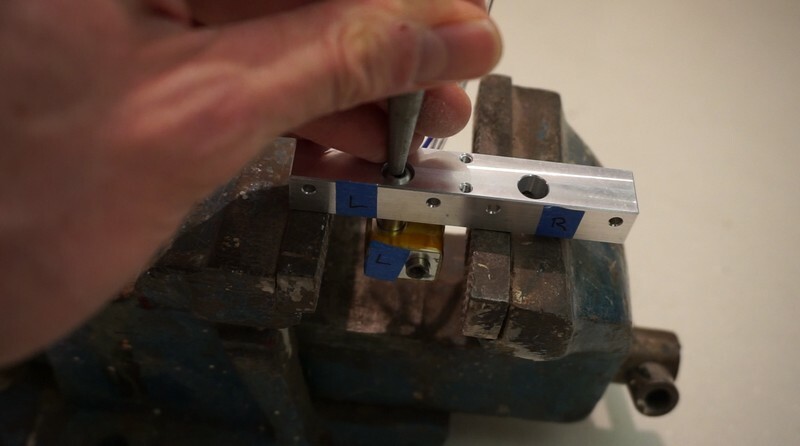 Mounting the nozzles is done by hand, as you need to be able to adjust them later on in the process. Per the instructions I bottomed out the nozzle and rotated it back 1/2 turn. The new thermal tube can then be screwed in, again using only finger pressure. If the preparation of the holes in the cooling bar was done correctly, the thermal tubes should slide in without friction, which they did. After the check I applied the thermal compound supplied with the kit and mounted the nozzle assembly back into the cooling bar. With a dual nozzle printer like the Dreamer it is critical to align the nozzles relative to each other. 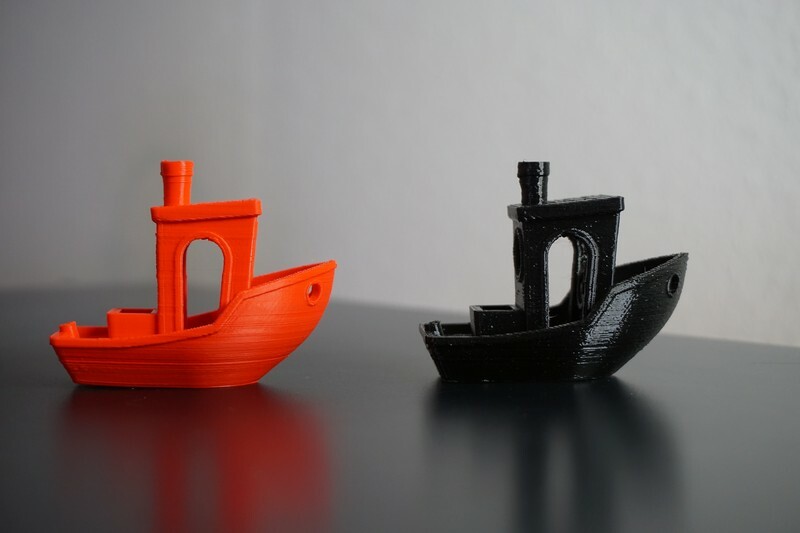 If the alignment is not performed accurately enough, the lower nozzle can knock objects off the platform that were printed with the other nozzle, or can negatively impact print quality in parts printed in dual extrusion mode. The instructions advise to use the build plate of the printer to align the nozzles. This is the easiest option, but you need to make sure that the platform was aligned properly before starting the procedure. If the platform is tilted, the error will be transferred as a height difference between the nozzles. The best option is to perform the alignment outside the printer, but this requires 2 equal standoffs of the correct height. Since I did not have these available I followed the procedure and used the bed for alignment. This is done by first pushing the bed against the lower nozzle and then lowering the other nozzle onto the bed. Reassembly of the extruders is performed in the reverse order. Fixing the wires again in the correct wire terminal is quite fiddlly. A pair of small pliers is indispensable for this job. The final step is to heat the extruders to operating temperature and tighten the nozzles. After the installation I ran the bed leveling procedure to verify the distance of the nozzles to the bed. The bed had to be lowered significantly for the new nozzles (my estimate would be around 1mm). The height difference was small enough that the alignment screws could be used for the adjustment. 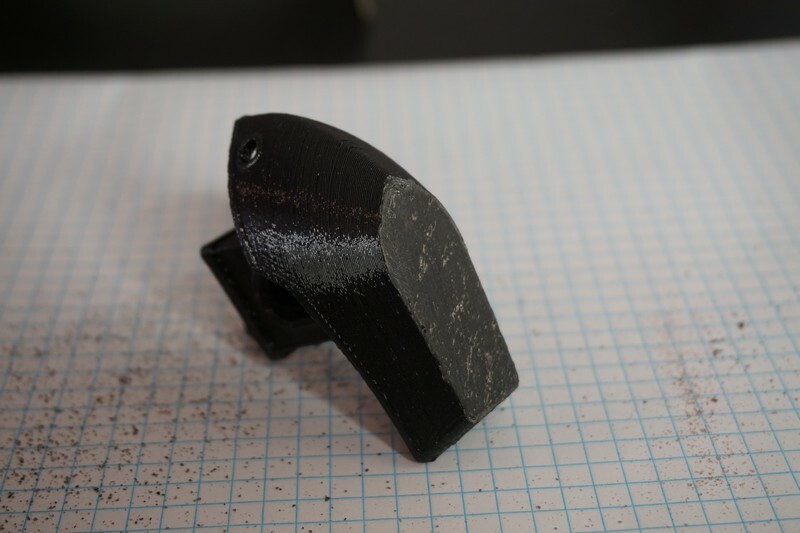 The height difference between both nozzles and the bed was measured using a feeler gauge and showed that the nozzle alignment procedure was actually quite accurate. No further adjustments were necessary. After the installation I performed a test print with PLA to make sure everything was still working before attempting more challenging materials. 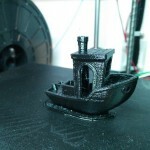 Loading the filament was performed without any issues. The stepper motors seemed to have no problem pushing the filament through the new all metal nozzle. 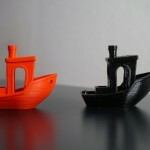 This would support the claim by Micro Swiss that the heat transfer to the filament is better than the standard hotend. 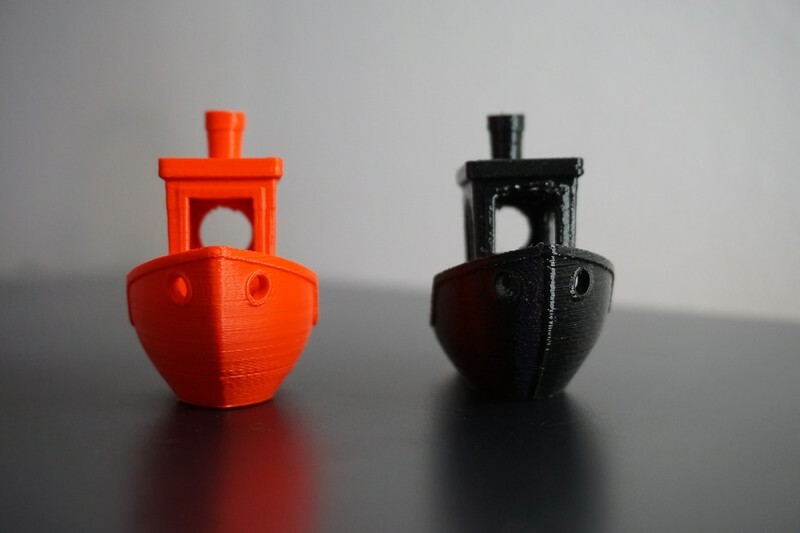 At this moment I am not sure if it is better, but at least it is sufficient to cope with the high flow rates used during the filament load cycle, which are much higher than used in the printing process. Even when loading filament for more than 10 seconds I did not hear the stepper motor skip any steps. The test part printed without any issues. 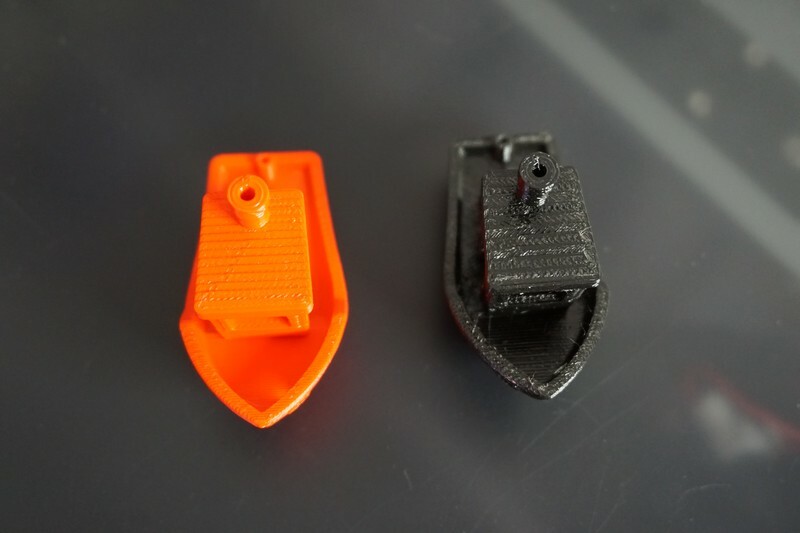 Although I did not print enough parts to compare the print quality with the old hotend my first impression is that the quality is at least as good. Now for the real challenge; printing with polycarbonate. This is something that is not possible on a standard Flashforge Dreamer, nor is it on the vast majority of 3D printers for home use. 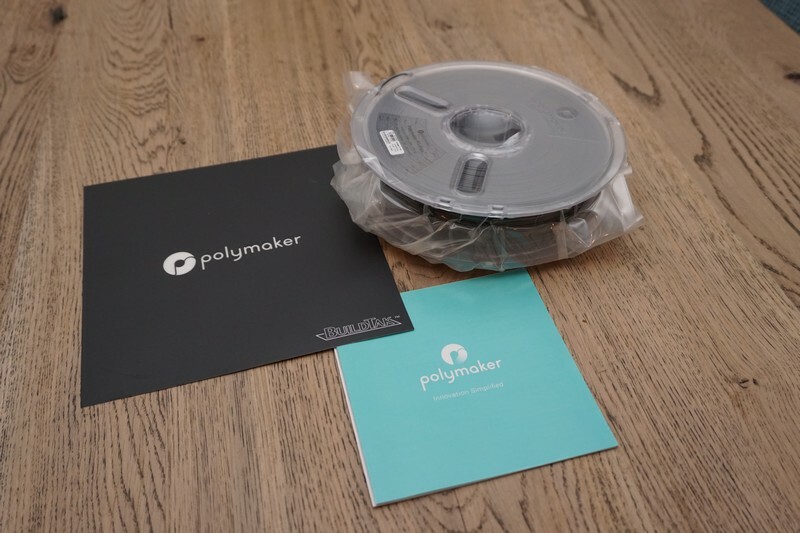 Polymaker released a polycarbonate filament in 2015, called PC-plus. 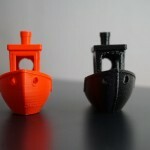 This filament requires an extrusion temperature between 250 and 270 degrees Celsius. The recommended heated bed temperature is 80 degrees C. It comes supplied with a Buildtak printing surface, since this is apparently the only surface that this material sticks to. Since my printer already had a (well used) Buildtak sheet attached to the print bed, I decide to use this first in case the build surface got damaged. 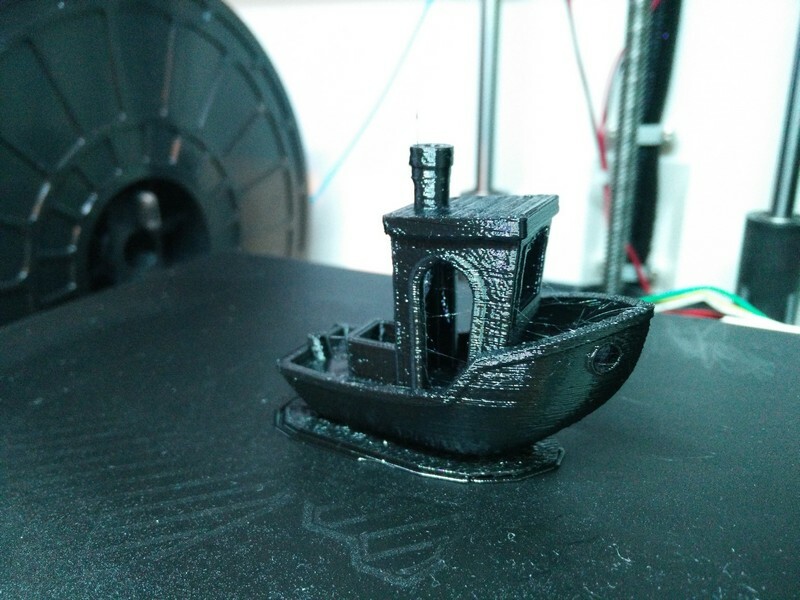 For the first test print I opted for the well known Benchy part. 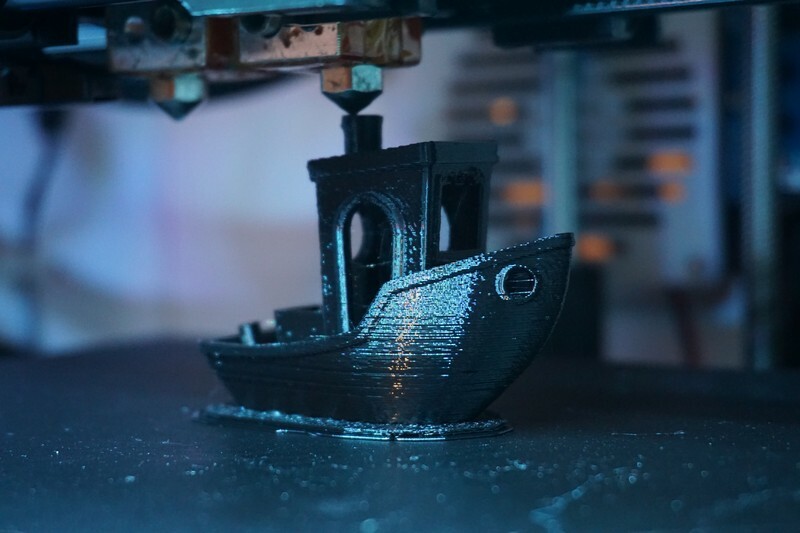 It has some challenging features, which would show the capability and possible issues of the new setup when printing PC-plus filament. 12-01-2017 Update: Depending on the firmware version of your Flashforge Dreamer the maximum set temperature of the nozzles may be limited to 248/250 degr. Celcius. I am not sure when the temperature limit was lowered, but firmware “dreamer_2.4.20160603” does allow 260C. However, the newer “dreamer_2.5.20161222″does not. Temporarily downgrade Flashprint to 3.12. It has the option to install the 2.4.20160603 firmware. After the firmware installation you can upgrade Flashprint back to the most current revision. Remove the internal SD card from the Flashforge Dreamer. The bottom of the printer has to be removed for this option, which is quite easy to do. Place the micro SD card in your pc using an adapter and replace the existing dreamer.bin under the subdirectory “sys” with this version: dreamer.bin. Make sure to backup the existing dreamer.bin, so you can return to your previous firmware in case there are any issues. The print quality for the part was, by my standards, quite acceptable. 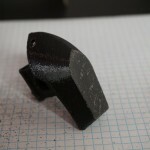 It did not reach the finish quality of a PLA printed part, but for a first test I was still impressed with the results. Removing the part from the bed required a significant amount of effort, but I was able to remove it without damage to the part or the Buildtak sheet. 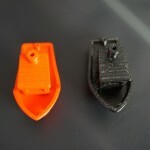 The Polymaker quide recommends setting the nozzle height to 0.3mm from the print bed. During this test the nozzle height was set to 0.2mm, which could explain the part sticking too well. Also the guide recommends a distance between the raft and the part of 0.3mm, which in my case was also 0.2mm. This caused the raft to be also very hard to remove. After removing as much as possible by hand, the rest was removed by sanding. When using increasingly fine grit sand paper a nice surface finish can be achieved. 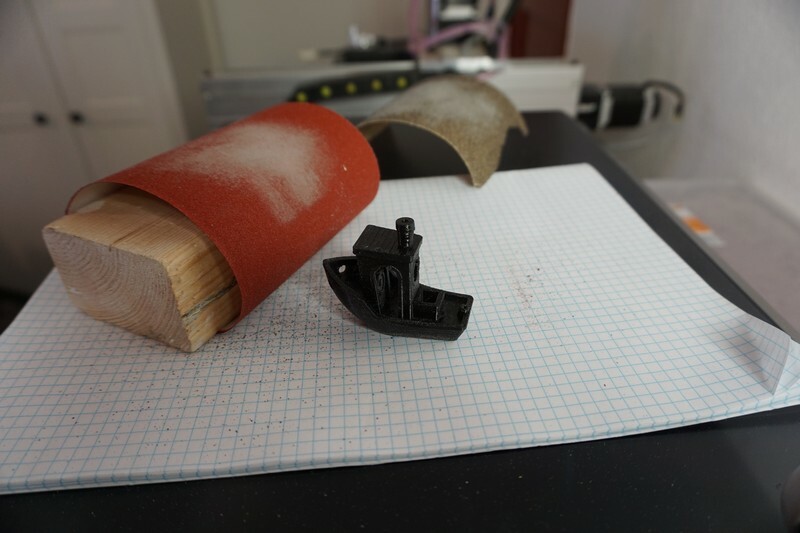 This also proved the claim of polymaker that the material was very suitable for post processing by means of sanding. Since this was my first experience with printing polycarbonate, I will probably have to perform a lot more experiments to uncover the possibilities of printing with this material and to find the optimum settings for the Flashforge dreamer in combination with the Micro Swiss hotend. If you have any questions about this upgrade let me know in the comments. And of course; should you attempt to perform a similar upgrade, it is completely at your own risk. hello, thank you very much for your detailed explanation of the assembly, can you tell me if these are the right ones? I am not sure if these are the genuine micro Swiss hotends, but they look very similar and appear to be the right type (MK10), so it might be worth a try. Good luck Robin. Is the cylindrical part of the cold end touching the top side of the aluminium heating block? If it is touching, this will bypass the narrow heat brake section, making it ineffective. If you first install the nozzle and then install the heat brake it should not touch. However, if mounted in the wrong order, these parts will make contact. Well after 4 more disassembly sessions and not much print output I went back to the original set up and have ordered the new Flexion HT Dual extruder upgrade kit that allows for hot end removal without removal of anything but the hot end. Thanks for your input, I just couldn’t bother with the MicroSwiss set up anymore. I guess for those it works for its fine but the disassembly routine is a total pain. Chalk it up to the fun and frustration of 3D printing. I fitted the MicroSwiss hot ends to my dreamer inspired by your video. I am Having big problems with ABS though. The ABS seems to be over-heating and setting in the tube and filament extrusion tunnels through the filament strand until eventually clogging the tube requiring a full disassembly to clean it out. Wondering if you have or haven’t had that problem or maybe suggest a remedy. I have stopped printing with ABS because of the smell. The last ABS part I printed was before the installation of the metal hotends, so I am not sure if my printer would have the same issues. PLA and PETG also work fine for me, without clogging. 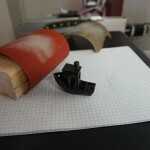 It might help to reduce the retraction length. I have seen reports of reducing the retraction length to 1 mm solving clogging problems. It would make sense that a larger retraction would worsen the issue, so it might be worth a try. I do like the accuracy of ABS. I will reduce the retraction length its set to 1.3 by default. I also tried with lowering the temp to 220, even clogged. Did you retain the insulation on the blocks with the MicroSwiss? I was thinking of trying without it. I left the insulation tape on the heating blocks for reducing heat loss. 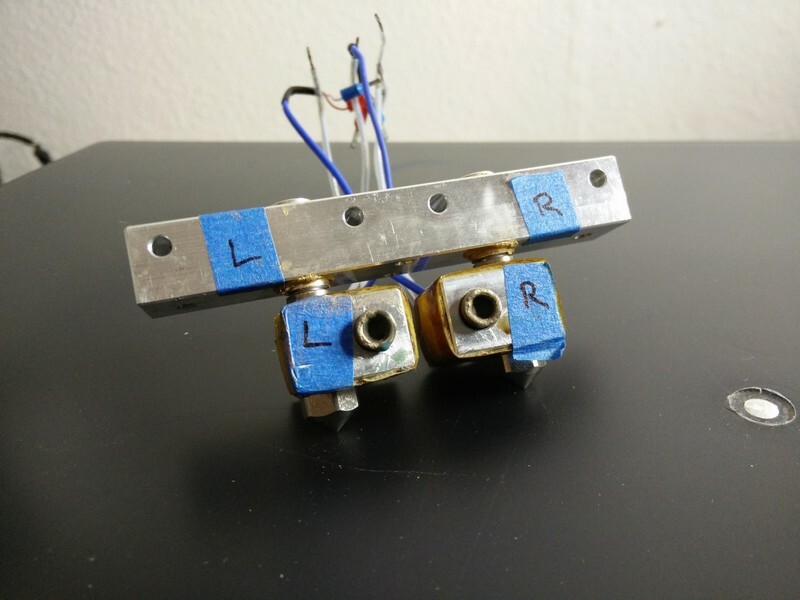 Maybe it also works without, but I think it would not solve the issue since the hot end itself will still try to reach 220C, which is also the intention. The high heat conductive properties of the aluminium will still distrubute the heat evenly across the block.I hope reducing the retraction works. I assume you used the conductive paste supplied with the hot ends to mount them in the cooling bar? This will facilitate a sharp transition between the cold and hot parts. I have tried both extruders with and without paste but none was supplied I used heat sink paste I had. What type of paste did you get? I am going to try another brand of ABS as I only had FlashForge ABS. I now have a roll of Zortrax arrived to try. If this doesn’t work I will give up on them its an absolute pain to strip out the MicroSwiss set up compared to the PTFE originals and every print seems to fail about an hour and a half in. David, I hope the new ABS from a different vendor will give you better results. Unclogging the nozzles frequently is indeed a pain. The set of nozzles I ordered came with thermal paste marked with Intel or AMD, so it is probably standard heat sink paste. If also the new ABS fails, you could also try asking micro Swiss customer support if they have any suggestions if you haven’t done so already.